Police are asking the public's help in identifying a man who was hospitalized last week after a choking accident. 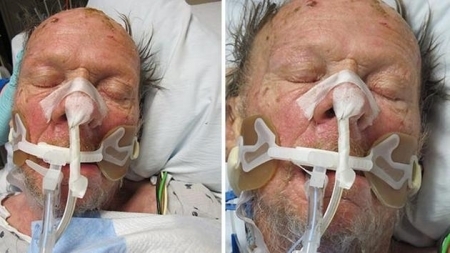 The elderly man was admitted to Temple University Hospital on December 12th around 6:00 pm. He had been choking on some food and was unconscious. The man has not regained consciousness since and neither police nor hospital staff have been able to identify him. See photos of him below. Anyone who recognizes him is asked to contact the Philadelphia Police Department East Detective Division at 215-686-3243 / 3244 or simply call 911. Authorities in Bucks County have filed charges against a man in connection to a false report during the manhunt for spree killer Bradley Stone earlier this week in Doylestown, PA. 34-year-old Luke Sanderlin of Doylestown Township has been charged with filing a false report, reckless endangerment and risking a catastrophe. Sanderlin told police on Monday evening that a man matching Stone's description attempted to car jack him near the Stonington Farm Apartments in Doylestown, Bucks County, and that he fired his gun at the suspect during a struggle. The manhunt, which had been centered near Stone's Pennsburg, Montgomery County home, suddenly drew valuable resources to the Doylestown area to search for the suspect in that area. Stone's body was found the next day in the woods near his home. Authorities say that Sanderlin made the story up apparently to draw attention to his fundraising efforts for a medical condition. He is being held on $250,000 bail. A man died early Saturday morning during a burglary of a home in Northeast Philadelphia. It happened around 2 a.m. on the 6100 block of Vandike Street in the Tacony/Wissinoming neighborhood. The 23-year-old man as caught breaking into the garage and trying to steal tools cand when confronted by the homeowner and his nephew. A struggle ensued and the burglar sustained a fatal head injury. No further details have been released, included the identity of the suspect and if any charges will be filed. Police are still investigating.